Towards a clean and green India, a machine has been installed at the Vadodara station that will crush the plastic bottles. As June 5 is a World Environment Day, this is an essential development aimed to curb the re-use of the plastic bottles and the dumping of the same on the railway track. The machine was inaugurated by the Vadodara MP, Ranjanben Bhatt and she says that the usage of plastic is very harmful to our environment, with the use of plastic, we cannot save our environment. 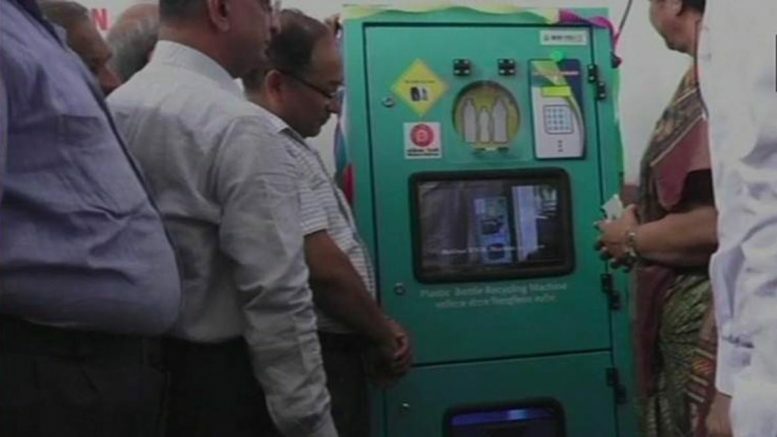 To discourage people from using the plastic bottles repeatedly, the machine will provide Rs. 5 to the person who throws a bottle in the bottle crusher. The person will get Rs. 5 Paytm cash as soon as he crushes the bottle in the crusher. Similar machines have been installed in the cities like Pune, Mumbai, Bengaluru and Ahmadabad. This piece of news is quite interesting and even the littered plastic bottles will be lifted and thrown to the bottle crusher. This is a good step to curb the use of plastic bottles and each city should take motivation from this. At least 10 such machines should be installed in bigger stations like Ahmadabad, Pune, Mumbai and other metro cities. This way people will be encouraged to dispose plastic bottle in the machine and we can hope for a clean and mess free environment for our generation to come. Be the first to comment on "Drop a plastic bottle in the crusher and Earn INR 5/-"